Note: Detailed informations on how to use the OSDK with a Linux operating system using Wine are given at the end of the page. The only important thing you need to do is to set an environment variable to locate the OSDK folder. Starting from this points the make file is able to locate the other files by itself. 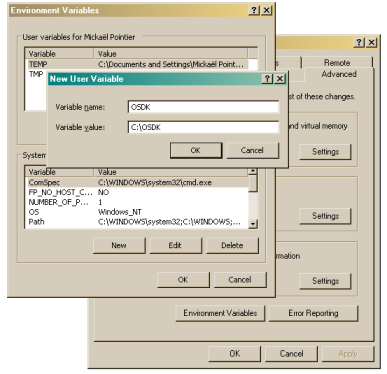 Optionaly, you can also define a second environment variable that will be used to run Euphoric using DOSBox. Doing this will allow you to run it with sound and in a Windows friendly environment. After setting up the variable, you can test if everything works fine, by simply trying to build and execute one of the samples. it simply means you did something wrong in the section (2). Please not that some versions of windows require you to reboot the system before the modifications made to the environment became effective. Now, you just have to run OSDK_EXECUTE.BAT, that should launch the emulator and run your program. If you don't remember, it's F10 to quit. Well done, you have compiled and run you first Oric program ! I agree that a native port would be probably more practical, but at least after some feedback and some attempts myself, I managed to successfully compile all the sample programs of the OSDK using Wine installed on a Ubuntu 6.06 LTS distribution. I think this is definitively better than nothing. The only part that do not work, is the Euphoric emulator itself, but this should be too much of a problem since the generated programs are compatible with all existing Oric emulators. When this is done, you can test that everything works fine. Note: The creation of the Build folder is failing. Probably the existing test that fails.